I use a refractometer during during boiling to keep a touch on the SG. Yesterday I started with 1.045, increasing up to 1.056 after 60 minutes of boiling. My receipe called for 300 grams of candysugar 15 minutes before boil-end. That increased the SG to 1.060. 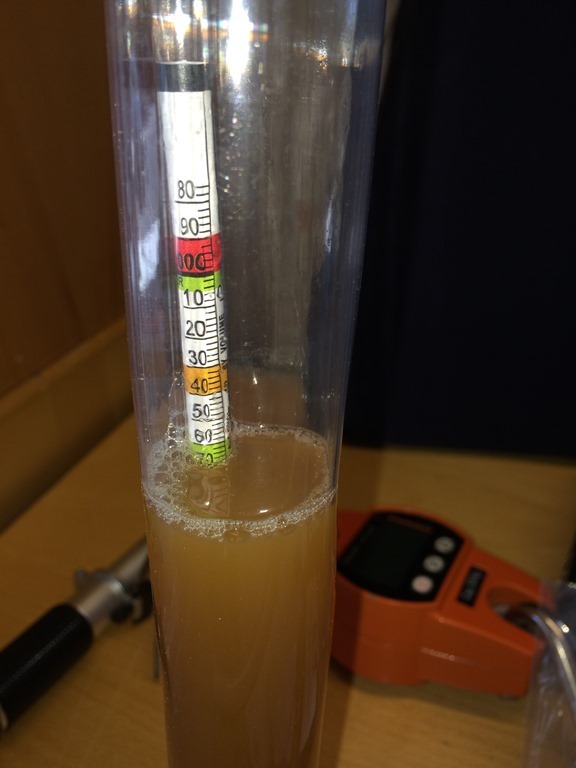 So, coming to the transfer to fermentation chamber, I took the last OG-reading and saw 1.057 :-) My hydrometer read 1.067. So, reading a lot again in this forum, I found an answer saying that refractormeter readings could be pretty unstable, especially if there are particles in the wort. Makes sense! Could I filter the wort through a coffee-filter before taking a reading? Or would I trap some sugars in the filter? Sounds like experiment time! Get the coffee filters, refractometer, and hydrometer out and let us know please. Particles, do not Change the Gravity of the Sugars. If you float on the water, you do not change the gravity, just the Volume, and if you Sink you only displace you volume, and Do not change the Gravity. Some refractometers are self adjusting...as long as the liquid is between 68F and 85F the reading will be correct. Was it this thread you read rvoith? I never got to a conclusion by the way, so would be interested to see if you get anywhere with filtering. I still think there are numerous factors involved that compound that anomaly. My personal opinion is that there are 2 main culprits. 1) Stratification, and 2) evaporation. What I have done to cut this anomaly down (not completely remove it) is to stir & mash the liquid (up & down) in the kettle VIGOROUSLY before taking a sample. Then when I take the sample with the transfer pipette I immediately put my finger over the end and allow the sample to cool inside the pipette without being open to the atmosphere. Once it has cooled inside the pipette, you can then measure on the refrac. Last edited by mally on 09 Jun 2015, 15:29, edited 1 time in total. joshua and mally, thanks for the replies. And yes, mally, that was the thread I was reading - perhaps a tad too fast, ha ha. I will most certainly try to coffee-filter the wort on my next batch and see if I can get more consitent readings. I will also have your tip in mind mally, to aggitate the wort before taking the sample, and to allow the wort to chill inside the pipette before taking the reading. PP mentioned in another thread about beeing too focused on numbers and I guess I am pretty much on "Stage 1" :-) I do not have too many brews on my back (only 3 so far, but trying to learn as I go. BTW - I blog about the progress here http://www.bobsbittelillebryggeri.no/ - all in Norwegian, but Google Translate might turn out something understandable :-)). The challenge is of course that you can read your brains out on all kinds of experiences, and one area is of course measuring SG, OG and FG. Some places one can read about "oh no, it should have been 1.070 and I only got 1.068!" and other seem not to care too much. It sounds like you are going through the exact same process as me! By the way I think the scale on your hydro is too wide (and/or deviations too small). I did consider getting a 0-50, and 50-100 hydro at one point but that meant more expense so just rely on the refrac now. There are good and bad points with both methods and it is your personal choice in the end which you use, but that pic highlights my problems with hydros IMHO. Last edited by mally on 09 Jun 2015, 20:02, edited 1 time in total.